What’s the Word For is kind of an awkward title. 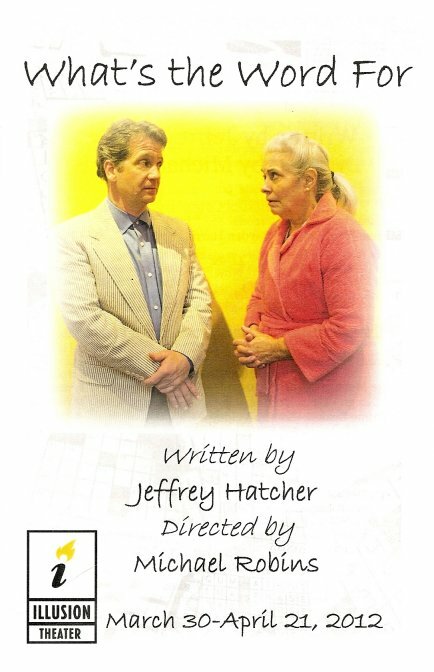 But that's the only thing that's awkward about this new play by Jeffrey Hatcher, commissioned by Illusion Theater. It's a beautiful exploration of the inter-dependant relationship between two unlikely companions. What’s the Word For tells the story of a college film professor who loses his ability to take care of himself after being injured in a car accident, and the nurse who takes him in. The title refers to Mrs. Caleodis and Hayden’s favorite activity – crossword puzzles. She reads the clues to him, saying “what’s the word for …” and he always knows the answer. He’s maintained an incredible amount of knowledge, but can’t remember simple things, like the titles of the movies he loves so well. He has to be reminded to eat and lock the door. Mrs. Caleodis has taken care of Hayden for 14 years, and has reached an age where she needs a little taking care of herself, after suffering several strokes. She tries to find a new home for Hayden, but he doesn’t want to live anywhere else or with anyone else (routine is very important to him). And she’s unwilling to let him go, too. They’ve created a life together that seems to work for them, however difficult it might be. Unfortunately they can’t go on forever in this way; change is coming whether they want it to or not. This two-person play features a couple of wonderful performances. I’ve seen several two-person plays lately; it's a nice format, the actors can really dive into the characters and their relationship (see also Werther and Lotte, Gruesome Playground Injuries). Melissa Hart, a Broadway vet who, fortunately for us, has made Minnesota her home (Frank Theatre's Cabaret last year, most recently Cat on a Hot Tin Roof at the Guthrie), is so natural as Mrs. Caleodis. She never appears to be acting, she just is this character. And Michael Paul Levin is also wonderful as Hayden, portraying both the sweet, confused, helpless version of the character, as well as a flashback to his healthier days when he was much less likeable. The two create a believable relationship onstage. This was my first time at Illusion Theater’s space on the 8th floor of the Hennepin Center for the Arts. (I recently their beautiful production of My Antonia downstairs at the Goodale Theater in the new Cowles Center.) It’s a lovely space with a beautiful view of the city. The audience was sparse on the Thursday night I attended, which always makes me feel as if I know a secret few others do. (Now you're in on the secret. :) This was also my first time purchasing a ticket through Goldstar, which is a website I recently ran across that’s like Groupon for local theater and other events. I bought a ticket to this show for under $10, including fees. I also purchased a ticket for the upcoming play Sea Marks at Gremlin Theater for a similar price. All you have to do is enter your email and zip code, and you get a daily email with deals. It's great way to keep up with what’s out there and see more theater affordably (which is nice when you see as much theater as I do!). What's the Word For is a great place to start.